Promotions are used to create a sale or discount on products. For example, you can set up a promotion for 20% off all items in the store. Or perhaps you'd like to give your customers free shipping if they purchase over $75 worth of items. All of this is done with the Promotion Manager. Promotions can be applied automatically, or with a promo code. The section below will outline how to set up a basic promotion. More specific examples will are given further into this article. 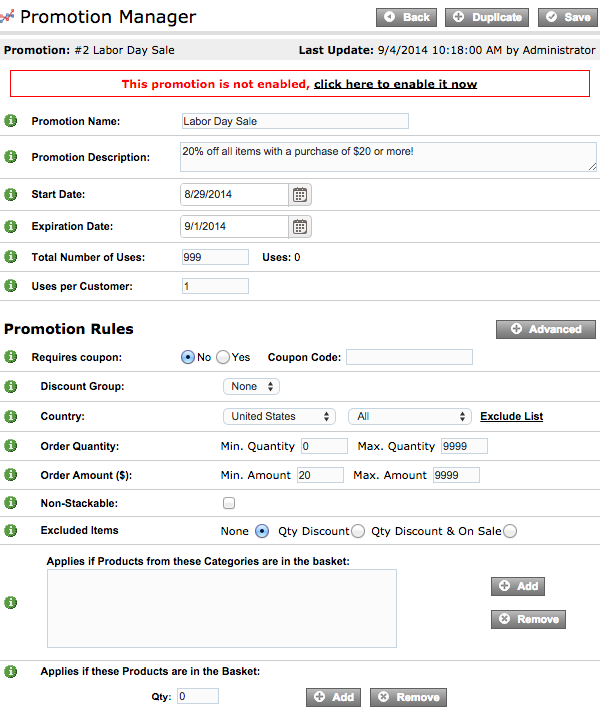 Enter a description in the Promotion Description field. For example: For Labor Day Weekend, all items are 20% off $20 or more. This will be displayed to the customer at checkout. Add the Start and End Date for the promotion. If you'd like for the promotion to start immediately, set the start date to today's date. Select whether you'd like the customer to receive the promotion automatically, or if a promotional/coupon code needs to be entered upon checkout. If it is set to Coupon Promotion, enter the code that you'd like customers to enter at checkout to apply the discount. Note: Only use a coupon if you'd like to control who knows about the promotion special, such as preferred customers, rather than having everyone that shops at your store use the promotion. Enter the value of Discount the customer will receive. Check the % checkbox if the discount is a percentage of the order total. The page will refresh, and more options will be displayed. In the Total Number of Uses textbox, enter the total number of times you'd like this promotion to be applied. In the Uses per Customer field, enter the total number of times each individual customer can apply the promotion. Click the Advanced button next to the Promotion Rules section. Select the customer group, country and state you'd like the promotion to apply to. If you'd like to exclude certain regions from receiving the promotion, click on the Exclude List link. Enter the minimum and maximum range of number of products the order must have to qualify for the promotion in the Order Quantity textboxes. For Example: A person must buy 2 hats to qualify for the promotion. Type in the minimum and maximum range the order must be in value to qualify for the promotion in the Order Amount($) fields. For Example: A person must buy $100 worth of items to qualify for the promotion. If this promotion cannot be used with any other promotions per order, check the Non-Stackable checkbox. You have the ability to specify which categories the promotion applies to. In the row containing the Applies if Products from these Categories are in the basket field, click Add to add categories. Click the Add button in the "Applies if these Products are in the Basket" section to add specific items for the promotion to apply to. Type in the quantity the customer must purchase of each item for the promotion to apply. Scroll back to the top of the screen and click "Click Here to Enable It Now". The promotion will not go into effect until you click the Enable link. In the Promotion Offers section, click the Advanced button. Check the "Is percentage" checkbox if you would like the discount to be a percentage of the total order, i.e. 15%. If it is not checked, the number entered in the box will be the dollar amount discounted from the order. Check the "Applies per item" checkbox if you'd like the discount to apply to each item, rather than the total order, i.e. $5.00 off each item, rather than $5.00 off the total balance. Choose the categories you would like the discount to apply to in the "Discount Applies to Products in These Categories" field by clicking the Add button. Click "Select" for each category you'd like the promotion to apply to, and then click Close this Window. 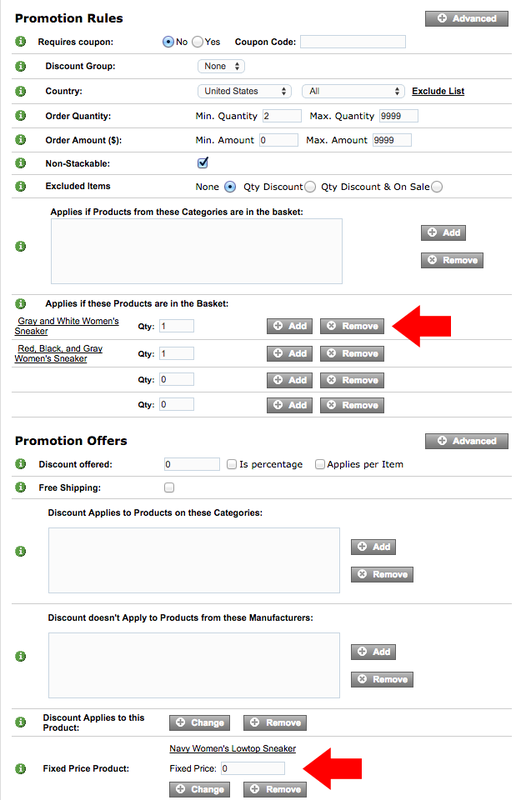 If you would like for specific Manufacturers' products to be ineligible for the promotion, click Add in the "Discount doesn't Apply to Products from these Manufacturers" section, then select them from the list that appears. Choose a specific product you would like the discount to apply to in the "Discount Applies to this Product" section by clicking the Change button. Choose a specific product you would like to offer for a specific price by clicking the Change button in the "Fixed Price Product" section.Note: This fixed price product cannot have options and must be In Stock for the free product to apply to an order. Note: By default, the promotion will be disabled until you manually enable it. This allows you to set up the promotion rules without customers trying to use it before it is ready. Below are a few examples outlining how to set up certain kinds of promotions. Add the dates you would like this promotion to be active for. If you want the promotion to start immediately, make sure these dates encompass the current date. In the Total Uses textbox, type the total number of available uses for this promotion. 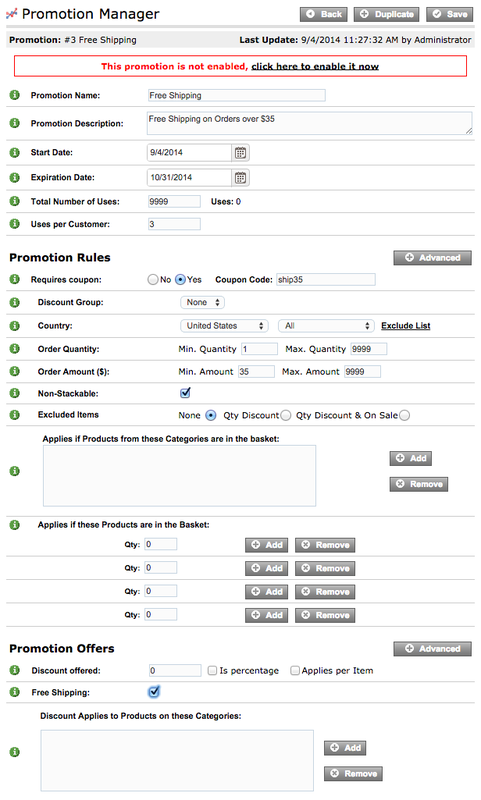 Enter the total number of times a customer can use the promotion in the Uses per Customer textbox. Enter the coupon number you would like to correspond with this promotion in the Requires Coupon field if you would like a coupon code to be necessary to apply this promotion. If you leave this section blank, the promotion will apply to all customers you specify in the discount group section. Coupon are used for controlling who knows about the promotion special, i.e. preferred customers. Select which Discount Group you would like free shipping to apply to in the Discount Group dropdown menu. Select the Country and Applicable States this Free Shipping Promotion will apply to. In the Order Quantity fields, enter the minimum and maximum range of number of products the order must have to qualify for free shipping. It should start low if it does not matter how many products a person purchases, i.e. 0 ? 9999. Type the minimum and maximum range the order must be in value to qualify for free shipping in the Order Amount($) fields. Use the minimum value the order must be to receive free shipping to start the range with, i.e. 20 ? 9999. In the Promotion Offers section, check the Free Shipping checkbox. Finally, go back to the top of the screen and click "Click Here to Enable It Now". The promotion will not go into effect until you click this link. In the Promotion Description textbox, add the details for your promotion. i.e. Buy one sweater, get a second free. Select which Discount Group you would like the promotion to apply to in the Discount Group dropdown menu. Select the Country and Applicable States this Buy One Get One Free promotion will apply to. In the Applies if these Products are in the Basket section, click Add to choose a specific product you would like the buy one, get one free promotion to apply to. For example: for a promotion of buy 1 sweater & get a second free, you would choose sweaters for this field. Type '1' in the Qty. textbox. Click Advanced next to the Promotion Offers section. In the Promotion Offers section, choose a specific product you would like to offer for free by clicking Change in the Fixed Price Product section. For example: for a promotion of buy 1 sweater, get a second free, you would choose sweater for this field. Note: This Fixed Price product cannot have options to work. If your products have options, we suggest creating an individual product for each option and choosing one for the Fixed Price Product. If your promotion is not functioning, there are a few settings that you can double check to make sure your promotion has been set up properly. In the top section of the promotion in the Promotion Manager, ensure that the Total Uses for the promotion is not at 0. Make sure that you have not applied the promotion more times than the allotted Uses per Customer. Make sure the order has been placed within the Start and End date for the promotion. Go to Marketing Promotion Manager and check the start and end date of your promotion. Make sure your promotion is ENABLED. Go to Marketing Promotion Manager and make sure the Enabled checkbox has a check in it.